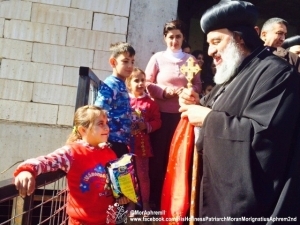 On November 6-8, 2014, His Holiness Mor Ignatius Aphrem II, Syriac Orthodox Patriarch of Antioch and All the East, and His Beatitude Mor Ignatius Youssef III Younan, Syriac Catholic Patriarch of Antioch, visited the displaced Christians in Northern Iraq. His Holiness was accompanied during this visit by His Eminence Mor Clemis Daniel Kourieh, Metropolitan of Beirut, and Very Rev. Raban Augeen Al-Khoury Nemat. 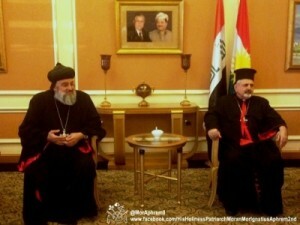 In Erbil Airport, His Holiness and the accompanying delegation were received by their Eminences Mor Timotheos Moussa Al-Shamani, Archbishop of the Archdiocese of Mor Matta Monastery, and Mor Nicodemus Daoud Sharaf, Archbishop of Mosul and Environs, along with a delegation of politicians and spiritual leaders. His Holiness held a meeting with the archbishop and clergy of the archdiocese of Mor Matta Monastery. He listened to their problems and the suggested solutions that they are implementing. His Holiness encouraged them to make every effort towards helping the needy and supporting our people in these difficult times. 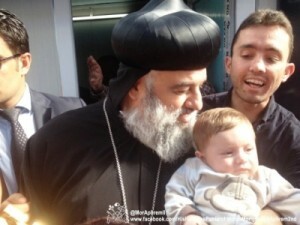 On Friday November 7, His Holiness Mor Ignatius Aphrem II celebrated the Divine Liturgy (Holy Qurobo) in the Church of the Lady of Light (Umm el-Nour) in Ankawa. 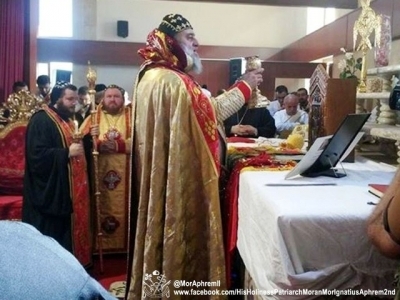 Their Eminences Mor Timotheos Moussa Al-Shamani and Mor Nicodemus Daoud Sharaf assisted His Holiness in the Holy Qurobo which was attended by His Beatitude Mor Ignatius Youssef III Younan along with some Syriac Catholic bishops and a large number of faithful. In the sermon, Patriarch Aphrem II encouraged the faithful to hold firm to their faith and their homeland. He told them that they are “the living witnesses of Christ in this land”. Moreover, he transmitted to them the solidarity of the entire Syriac Orthodox church with them in prayer and offering all possible help. His Holiness and the accompanying delegation then visited areas that were especially prepared for hosting the displaced in Ankawa, Kasenzan. He listened to the problems that the people are facing and their pressing needs. He also visited the sick and old people. 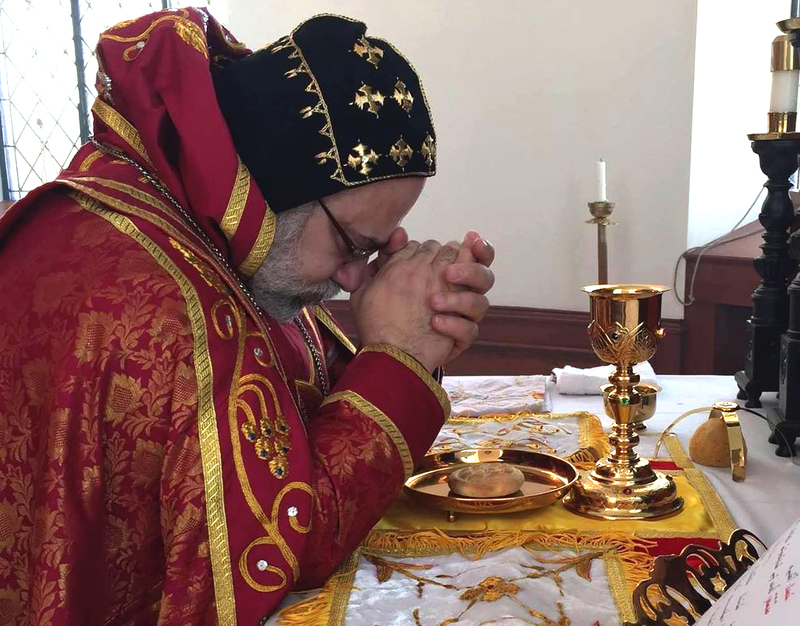 On Saturday November 8, His Holiness Patriarch Aphrem II attended the Divine Liturgy celebrated by His Beatitue Patriarch Mor Ignatius Youssef III Younan in St. Joseph Church. During the Holy Qurobo, His Holiness encouraged the faithful to preserve their faith and endure the persecutions with hope in God and comfort from the Holy Spirit. After the Divine Liturgy, His Holiness and the accompanying delegation visited Mall Shlama where a large number of refugees and displaced families are living. They also visited the camps in Ankawa and the Youth Center. On Saturday, His Holiness, His Beatitude and the delegation returned to their residences in Lebanon.